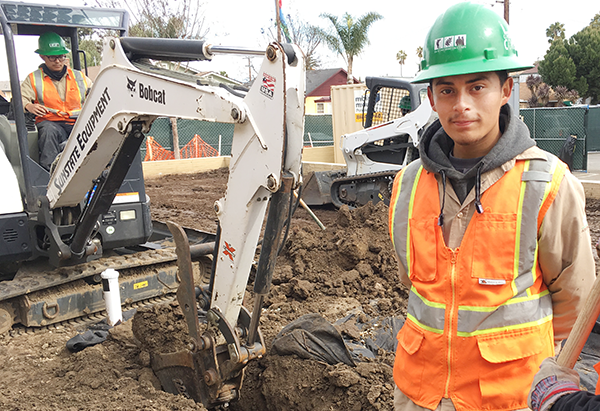 LA Conservation Corps » Meet Anthony. Anthony is a Corpsmember from Westlake who has been working hard with the East LA crew. He’s part of a team that is turning the Woodcrest Library’s outer yard into a new and improved pocket park. Once completed, the pocket park will have new seating, native plants, exercise equipment, and stationary musical instruments for people of all ages to enjoy. So far, Corpsmembers have removed five “Super 10” large dump trucks’ worth of dirt, installed water tanks under 8-10 feet of ground and dug trenches to the street with shovels and a Mini X machine. Anthony has a lot to feel good about with his role as a Corpsmember. He heard about the Corps from his grandmother, who raised him and urged him to stay focused and complete high school. Once he joined the Corps, he made up all his missing credits in just one semester and earned his high school diploma with us! Anthony has learned a lot with the Corps. 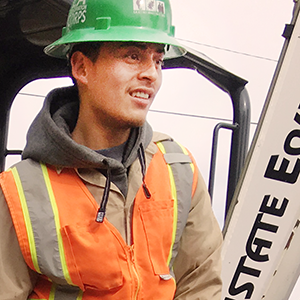 He now knows how to use a Bobcat and has received certifications for OSHA; CPR; and, hazardous materials, asbestos and lead abatement–valuable skills for the workforce he’d like to enter. He’s hoping to secure a union job, but first his mind is on getting his driver’s license and hopefully moving up to a new level at the Corps by becoming a Corpsmember Driver. He has a clearer vision that he’s motivated by now. We welcome positive, uplifting messages to our Corpsmembers. Subscribe to our e-list to learn about other Corpsmembers and their successes.